I call it that because there is literally no competition! Of course, everyone wants to obtain all the flowers and their different variants, but people help each other get them all. There are no special plants for people who pay, because they just don't have any. So, there isn't any plant or flower that any one can't get. So, it's very nice that way. The administrators are very present on the forum too, which is always nice. They are happy to take suggestions and we see them turning them into reality all the time. I have a great example too! They changed the background color from a dark green to an rather ugly tanish color. I disliked it so much, I started a thread about it and was trying to help them figure out an alternative. I ended up making the background graphic they now use. I posted it on the thread suggesting they make something like it, but they liked it so much, they just used mine! I was thrilled! They gave me a seed of my choice - which is why my Heart of Valentine has a June date. Check it out here! 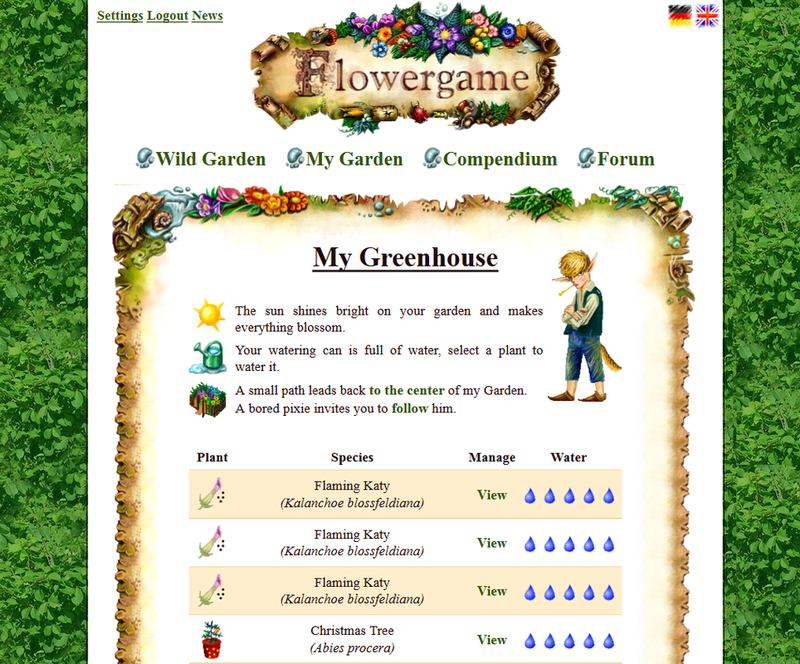 If you join Flowergame after seeing my site, please send me a PM - you'll be glad you did!